The turn of the New year saw the start of a new project that has been in storage waiting it's turn in the workshop for far to long and so on a cold misty damp day the Dodge D15T was pulled out of storage and moved into it's new home ready for total strip down, restoration and rebuild. 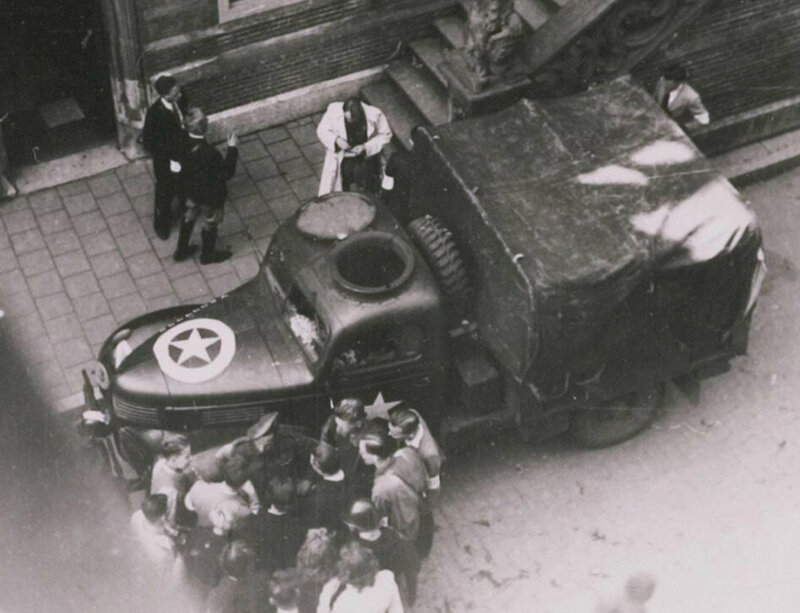 A couple of photos of the move here and in the next installment a bit of background history on the type and of this truck in particular. I apologize for the quality of these first photos however it was a damp misty evening and dusk was fast approaching but I hope they give the general idea and sets the scene. Interesting Pete, looking forward to the history. it's a proper tanker too, with the chequer plate rear steps. There was one round here that went south years ago, if this is it I have some engine info that may help. yes it's the same truck you had up your end of the world information would be very useful please. Well for many years it was configured as a wrecker and lived at a Mushroom farm in Dunblane with four jeeps ( I can't stand the things - Mushrooms, not jeeps ). It was bought and driven home to Plean by the new owner, but eventually developed a knock on the number six rear big end bearing - oil circulation or failing water distribution tube maybe? Of course nobody had a clue where to get long block Canadian Dodge engine spares in those days, so the owner just pulled the wrecked bearing, sized the crank, which was damaged but not that badly, and got a new set of big end shells from Glacier locally. I think when they were still loose on that crank journal he ground the face of that one cap slightly to take out the slop, so when you strip it you should do a particular check on the number 6 big end bearing journal, then bolt the bearing cap to the con rod and see how oval it is. I think he ground about 10 or 15 thou off the face of the cap which you may well be able to recover if you know to look for it. Apart from that it was fine, and I think it went to Durham when it left Stirling area. Ten of the twelve new big end shells were in the glovebox when it left. 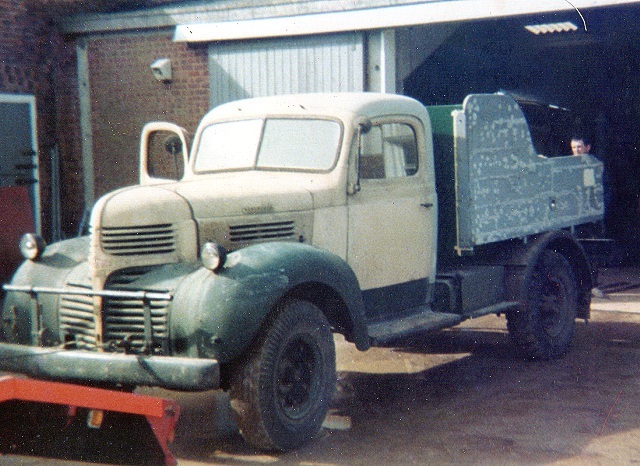 Solid truck, indoor stored all its days when it was in Scotland. 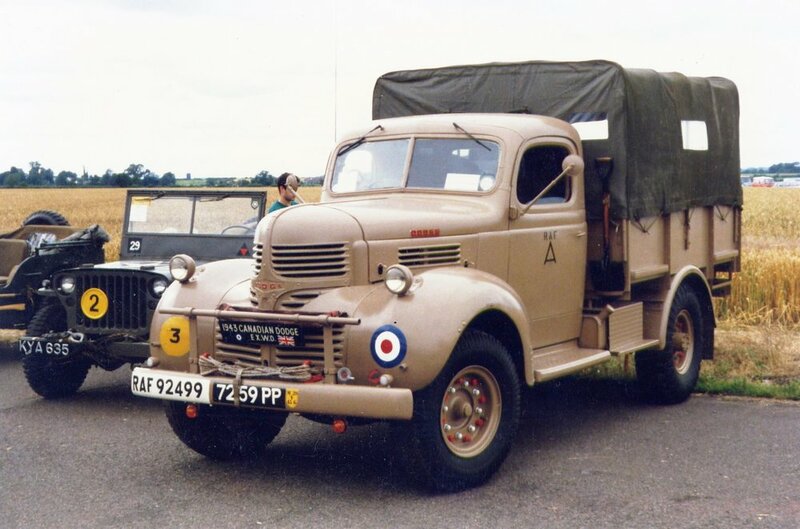 Thanks Gordon for the information I'll post the post war wanderings of this truck in a later post perhaps you could confirm it's the same truck as the one you describe above. 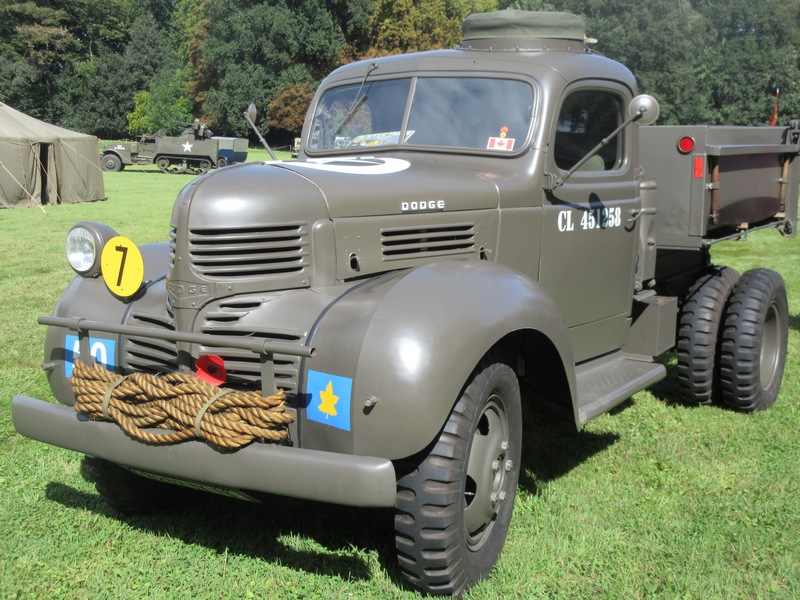 Most MV enthusiasts and modellers have heard and can recognise the Canadian Dodge range of WW2 trucks however more detailed information appears more difficult to come by. 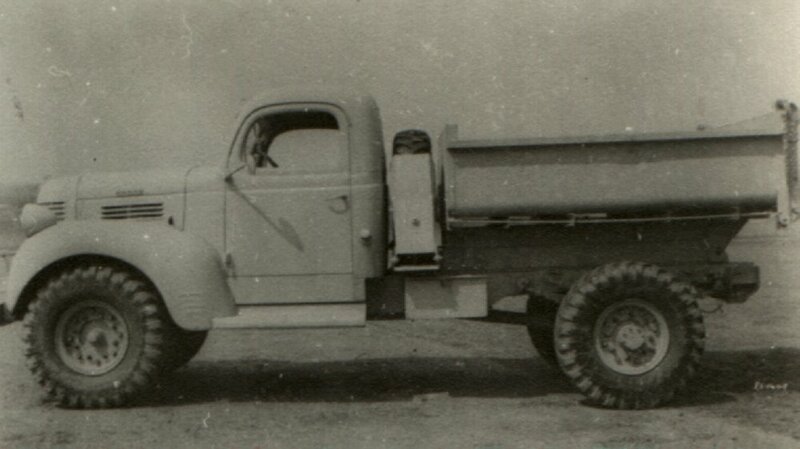 The range covered included 15cwt, 60 cwt Short and 60cwt Long wheelbase versions including Dump, Water Tank and GS bodied trucks all using a 4x2 drive line with 4 speed box with 2 speed axel for the D60S all models used the long block version of 6 cylinder 95bhp Dodge side valve engine and standard pre-war commercial cab and front end. 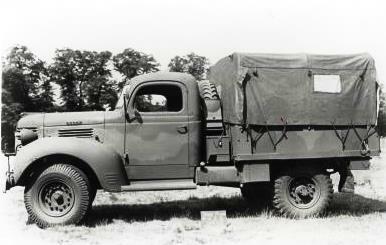 The historical record has been somewhat overshadowed by Ford and Chevrolet production, as a result of this lack of focus readily available information for Dodge Canada regarding award of contract dates and production numbers for trucks in each class are not readily available which is a shame as the company provided a significant number of trucks for the British war effort. The majority of 15cwt production was dedicated to GS bodied versions D15 GS (Van) around 5,000 trucks, however two contracts were for 200 gal capacity water tankers D15 T under British contract numbers Supply Mechanical 2989 (1428 trucks Z5597435 to Z5598863) and Supply Mechanical 6087 (473 trucks Z6087 to Z618871). 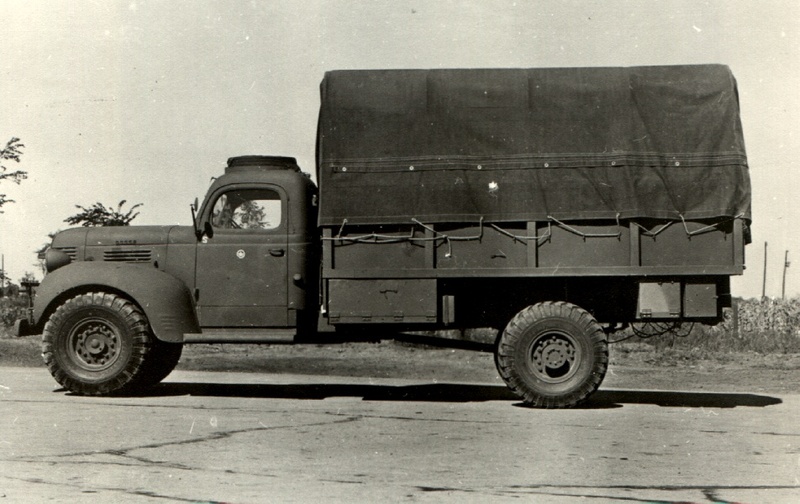 The trucks were delivered to the UK fully fitted with Canadian manufactured tanks and equipment the tank design differing slightly to the standard British water tank as fitted to the well-known Bedford and Morris 15cwts. 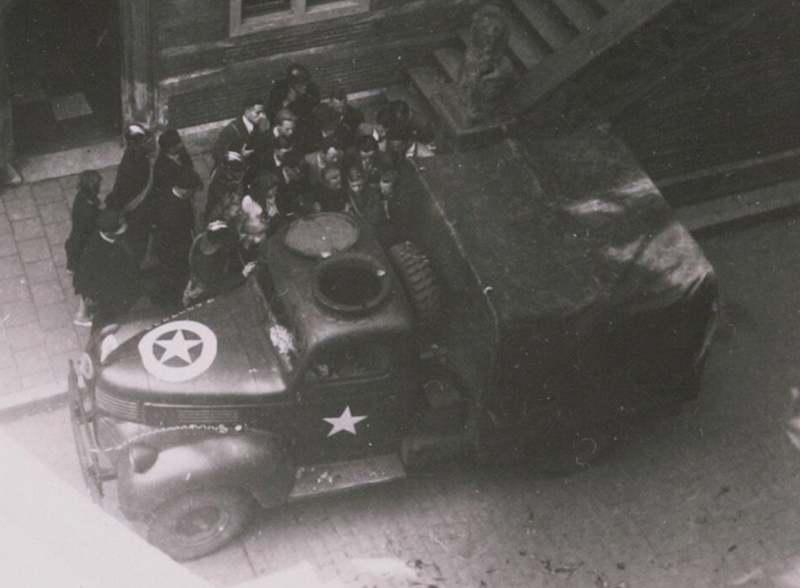 It would appear from photographic evidence and census number allocation lists that Dodge 15cwt production was almost entirely taken up by the British and Dominium forces excluding Canada who standardized on Ford and Chevrolet models in the same weight range the water tank version only being produced by Chevrolet. Next instalment will focus on the known post war history of my particular D15 T.
Good to hear Pete, but something is slightly off. You describe it as a D15T (presumably for Tanker) but I'm sure when I read the dash plate it said something like D15W ( presumably for Water ). Can you check the dash plate for me please? Might be old age and ( lack of ) memory. I tracked down where the Mushroom Farm was, now long gone. It was Sheriffmuir Road, Bridge of Allan. If you check it on Google Maps you can see one lump of new housing development where the farm used to be. I do remember that, like the C and F series Canadian trucks, all the water tankers had chequer plate over the fuel tank on each side to act as steps when accessing the tank - which of course the cargo truck didn't need. The D15 only came as cargo or tanker, of course, the dump bed didn't go down to that load rating. I do have an image somewhere of the No 13 cab variant of the D15, presumably just prototyped. Courtesy of Colin MacGregor Stevens. It would be easy enough to make that, just start with a D15 cargo with a wrecked cab, and add a Chev No 13 cab, Ford grille, and all the handmade bits. 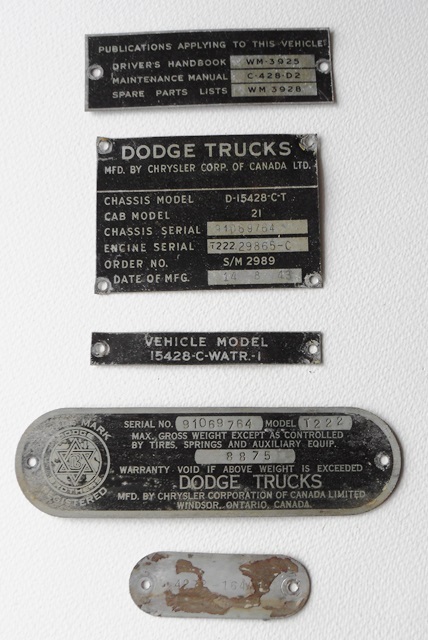 Your memory is faultless Gordon full marks for recall here's a photo of all the cab plates from the truck the one you refer to in your post above is 3rd from the top and is the Canadian CMD type identifier. Thanks Pete, WATR is what I was remembering. Good to know my brain is still functioning. Good to see you started a blog for this one! I will certainly be following this thread as I have always had a soft spot for the Canadian Dodges. 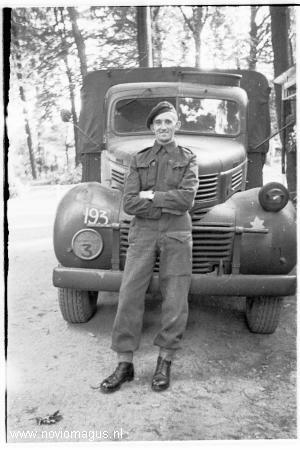 I think I have a picture of a D15 GS in Canadian service somewhere.....but indeed, that's the only I have found so far of a D15 in Canadian service. It seems the Canadian did use quite a few D60L GS trucks, as they do come up in pictures. 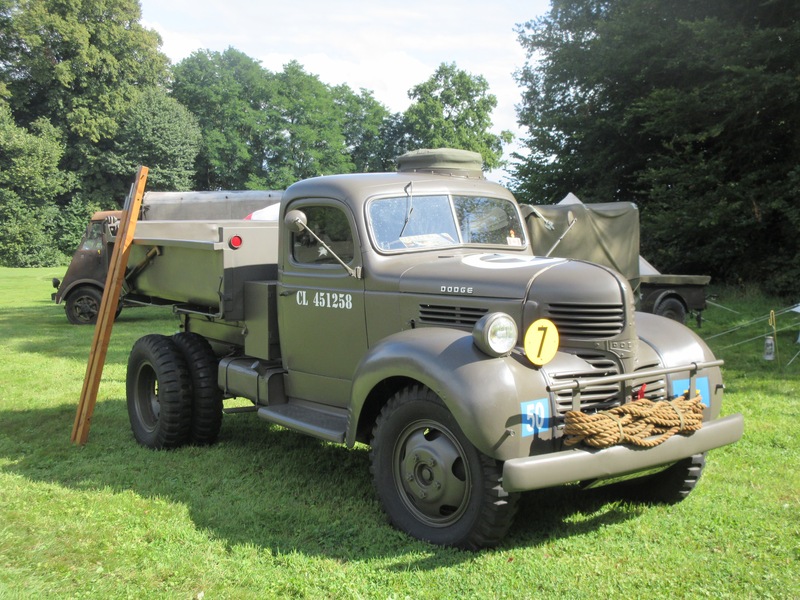 Manufactured on the 14 of August 1943 in the Chrysler Dodge Brothers plant Winsor Ontario for British contract number Supply Mechanical 2989 this covered 1428 water trucks given British census numbers Z5597435 to Z5598863. The following year a second contract was delivered under Supply Mechanical 6087 for another 473 trucks Z618871 to Z6169344 so it would appear that total production of type was 1901 water trucks. The next 31 years of the trucks history currently remain a mystery. The release date is unknown but a green registration document claims the vehicle was first registered on the 10th April 1974 registered in Aylesbury, Buckinghamshire as a ‘mobile crane/recovery vehicle’, colour of vehicle is given as ‘green and cream’ so at some point prior to this it has lost the original tank and gained a smart paint job however the first registration seems very late to coincide with a release from service so I suspect the truck was operated by a garage on trade plates prior to this date and the actual release date could be as early as the mid-1950s. The following year I purchase the truck and move it to West Wales and put it into storage awaiting its turn in the workshop. 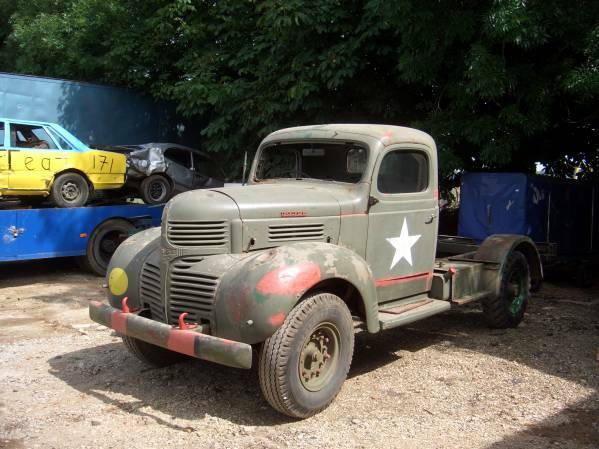 The truck is remarkably unmolested with many original fittings still in place and is in exceptional condition. From the general condition it appears not to have covered many miles under its own power the speedo reads 15000 miles and I suspect this may well be the original unit sadly the Canadian tank is long gone but I have a good British 200 gal tank that will be used for the time being the last photo is taken in the workshop awaiting strip down. If I had to guess closer to twenty-five years Pete. 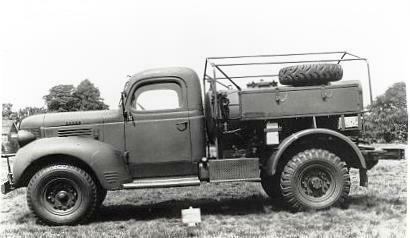 It was a very solid, clean chassis cab when I worked on it, looks a lot more worn and weathered now. It's noticeable how a lot of these trucks survived half a century when stored inside, but go west in a hurry when left outdoors. It's noticeable how a lot of these trucks survived half a century when stored inside, but go west in a hurry when left outdoors. Interested to see that Alex if you can find the photo, it's certainly very rare to see any evidence of Canadian use. The British RASC and RAOC used a lot of D60L's in Italy and Northern Europe and the Free Polish forces seem to have been issued with a high number of D15's and D60L's. 1, D15 in Canadian service and 2, a round roof hatch, I've seen photos of D60S and D60L with the hatch but not a 15. First task was to remove the water tank this will be restored as a separate project after the truck is completed to chassis cab stage the mobile gantry crane is invaluable for this type of work. With the tank removed the next step was to strip out the cab of instruments, seat, door trims and the careful removal of the original wiring harness which will be used as a pattern and replaced with modern cotton covered PVC wire in the correct colours and terminals the loom will then be sent away for over braiding. The early contract cabs were fitted with commercial pre-war gauges shown in the photo below. Later Dodge contracts used standardized round military gauges identical to the types used in later 13 cabs Ford and Chevrolet CMPs. The dash area of the truck has not suffered too badly from the usual post war civilian addition of extra switches and gauges in fact there are only two additional holes that will need to be closed off. All the Data plates for the truck are still in position and in good condition. Now removed and stored away along with the gauges and will be some of the last items to be refitted when the restoration is complete. This could be another D15 in Canadian service, but you just can't be sure without seeing the AoS. The census number starts with "Z", not "CZ", but than again we have seen numurous pictures of Canadian vehicle census numbers lacking the "C". Glad to see you still have her!. The engine had been changed by the chap I bought it from, he told me he obtained a replacement from a USAF disposal from Molesworth. It is a long block Chrysler, but is post war made iirc. Anyway when I bought the truck the original Canadian block was in the back, and I still have it here. Interestingly the engine number is stamped into the chassis. If you would like the original engine I'd be more than happy for you to come over for it, or I could bring it to you during the summer.